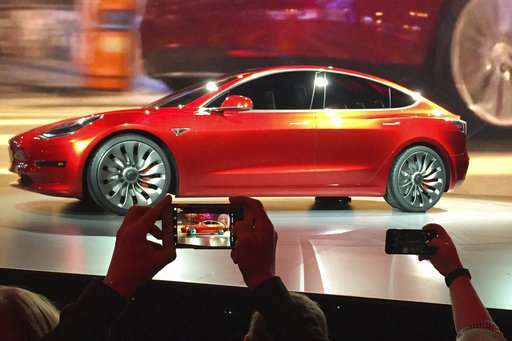 That's at the low end of the company's prediction earlier this year of 47,000 to 50,000 Model S sedan and Model X SUV deliveries in the first half, as much as a 71 percent increase over a year ago. Tesla said that as long as global economic conditions don't worsen considerably, it is confident that second-half Model S and Model X deliveries are likely to exceed deliveries in the first half. Musk's tweets about the Model 3 appear to erase doubts that Tesla would be able to meet deadlines for mass producing the cars, which is key to the company making money. Previously it has faced delays in getting vehicles to market. The Palo Alto, California-based company aims to make 10,000 Model 3s per week in 2018. Until recently, Tesla owned the market for fully-electric vehicles that can go 200 miles (322 kilometers) or more on a charge. But that's changing. GM beat Tesla to the mass market with the Chevrolet Bolt, a $36,000 car that goes 238 miles (about 383 kilometers) per charge. Audi plans to introduce an electric SUV with 300 miles (483 kilometers) of range next year; Ford will have one by 2020. Volkswagen plans more than 30 electric vehicle models by 2025. Automotive competitors like Mercedes and Volvo—not to mention tech companies like Google and Uber—can also match Tesla's efforts to develop self-driving vehicles. And they have deeper pockets. Tesla has had only two profitable quarters in its seven years as a public company. 215 miles is not equal to 133 km. Given Tesla's track record, and the specs of the car, the EPA mileage of the $35,000 base model will be around 175 miles. The real price for the Model 3 that can actually go over 200 miles, the "typical option packet" that has the larger battery, will be around $42,000 even according to Elon Musk himself. I think the 200 miles is plenty for the overwhelming majority of people. Think back how often you've driven more than 200 miles a day (or 400 if you allow for one recharge stop). You can probably number these occasions on one hand for the past decade. It's nice to have some reserve. But at the end of the day one has to be realistic about what one *might* need vs. what one actually needs. Yes, I could buy a truck because I *might* need to haul large cargo from A to B some day. But realistically: do I ever do that? No. The number of (private) people (i.e. who make up the mass market) who will benefit from a jump in range from 200 to 600 miles is marginal. 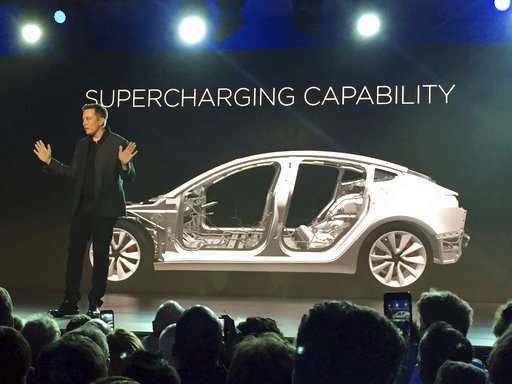 Even so: Future battery tech is a drop-in replacement. So you can always upgrade if it really becomes necessary. It's nice to have some reserve. It's actually better for the car to have overprovision, because a small battery will wear out faster - the charge/discharge rate for a 20 kWh battery is triple that of a 60 kWh battery, so while you would only need 20 kWh most of the time, it will break down on you very soon. The second reason is convenience, because you don't have to recharge the car absolutely every day, and plan your trips on the availability of 240 volt sockets absolutely everywhere you go. I have a car that goes 500-600 km on a tank. I refuel it about twice a month. At the end of the day, the hope is that the EV chargers (which provide the juice to cars without cost) will bring more customers. One thing we are finding out is that shoppers charging their vehicles spend more time at our malls than the typical shopper. For a couple of cents worth of electricity they get new shoppers (and those to shop longer). They are throwing free energy at you. That seems like a win-win if ever I heard one. The number of (private) people (i.e. who make up the mass market) who will benefit from a jump in range from 200 to 600 miles is marginal. The real benefit is the fact that you can jump in your car and rarely need to consider whether you have enough charge to get somewhere. A huge battery would also enable you to make use of electricity discounts, because you don't necessarily have to charge for days or weeks. Even so: Future battery tech is a drop-in replacement. Assuming no planned obsolescence. It's unlikely a new battery option will be offered for a car that's already past warranty, because the company wants to sell you a new car. Until they start to slow down the charging to keep you in the shops. Shopping malls are a bit of a dying species, because the shops are often pointless chain stores that all offer the same products that don't interest people. The real benefit is the fact that you can jump in your car and rarely need to consider whether you have enough charge to get somewhere. Which is a given with EVs because you ALWAYS have a full charge in the morning. You ALWAYS know how far you can go when you hop in your car. This "Oh, today I need to go 600 miles and I hadn't planned it" situation is totally mythical. I've been driving for over 30 years and I have *never* encountered that situation (and even if I had encountered it once - or even 50 times - it wouldn't be an argument against getting an EV). ... the fact that there is existing free public infrastructure to charge EV's at every street light pole across the planet is something no one ever talks about. Except when there's been a power cut, the charger had a glitch, you forgot to plug your car in, or it's not actually the morning but afternoon and you need to go somewhere, but you've already driven your battery dry. This "Oh, today I need to go 600 miles and I hadn't planned it" situation is totally mythical. That's disingenuous of you. It's not about suddenly needing to drive across the state and back - it's about the fact that even when the tank is nearly empty, you just don't have to worry about it because the car can still comfortably drive another 100 miles. the fact that there is existing free public infrastructure to charge EV's at every street light pole across the planet is something no one ever talks about. You can't really charge an EV out of a regular outlet. What I mean is, think of your smartphone. People are constantly worrying about running out of battery and the first thing they do when they come over to visit is to ask where the charger is. I see people carrying power banks whenever they're off for a weekend trip, and I myself have one because using the satnav can empty the thing in just 10 hours. That's because modern phones only have enough batteries for 2-3 days, or less than 1 day if you actually use the phone for anything. It's been a step-back to 1995 when the best phone on the market would operate for a day and a half. This is just a compromise we've made to have smartphones, because batteries didn't get better as fast as the demand for energy. People still would prefer to not have to charge for a week. Really? That's your argument? I mean...really? When was the last time you had a power cut? What kind of banana republic are you living in? or it's not actually the morning but afternoon and you need to go somewhere, but you've already driven your battery dry. Suuure..because you drive 200 miles in the morning. Riiight. Any more such 'great' arguments? Seriously: when was the last time you drove 400 (or even 200) miles in one day - AND hadn't known the day before? Answer: never. And I'm gonna call BS if you claim this happens regularly to you. Funny how people do it all the time, though. Reality - meet fantasy. Really? That's your argument? I mean...really? Yes. Really really. They happen, and regular cars are totally immune to them. The frequency of power cuts is irrelevant to millions of people who find themselves stranded when one actually does occur. Suuure..because you drive 200 miles in the morning. 100 miles out, 100 miles in. Easily done in a working day. Maybe you took the kids out to the sea on the weekend, and on return you figure you still have somewhere to go - but oops the battery is empty. Seriously: when was the last time you drove 400 (or even 200) miles in one day - AND hadn't known the day before? If I skip one night of charging for any reason, I have actually two days of driving by the end of the second day. You know perfectly well what I mean: it takes ages because a regular outlet doesn't give much current. And I'm gonna call BS if you claim this happens regularly to you. That's just shifting goalposts. It isn't about me. we find that 9% of the vehicles in the sample never exceeded 100 miles in one day, and 21% never exceeded 150 miles in one day. These drivers presumably could substitute a limited-range vehicle, like electric vehicles now on the market, for their current gasoline vehicle without any adaptation in their driving at all. For drivers who are willing to make adaptations on 2 days a year, the same 100 mile range EV would meet the needs of 17% of drivers, and if they are willing to adapt every other month (six times a year), it would work for 32% of drivers. They happen, and regular cars are totally immune to them. That strike you as a relevant case? Really? If you're an average driver you can skip more than a week of recharging. So? it takes ages because a regular outlet doesn't give much current. Over night gives you 'ages'. Where exactly is the problem? No. This has nothing to do with me. Don't try to make it about me to build some strawman. It's getting really really annoying. Power cuts, brownouts, glitches - happen everywhere. Even in your town, though you might not notice because the entire grid doesn't go down - just some branches of it. Everywhere you get trees falling on power lines, someone accidentally digging up an underground cable, storm damage, etc. And when they do, the chargers go to a failsafe mode and stop charging. Yes, if. Problem is, almost nobody is an "average driver". See the article I posted above. It's the illusion of the middle. The US air force tried to design a seat for the average pilot and found out it fit almost nobody - guess why? The question wasn't about overnight charging, but about stopping to some random streetlight and pulling power from it, and why that is not practically feasible. It is also not practically feasible, because things like streetlight grids are sized according to the expected load, so they don't waste copper on unnecessarily large cables. If you put a charging socket on every parking meter and streetlight, you have to make sure the system can safely deliver the current if and when multiple cars connect to it. Even in countries where it's common to have sockets for block heaters in every parking lot, the typical practice is that each socket is on a 15 minutes per hour rotation and switches off to reduce the load on the property's utility connection. LOL, sounds like you ordered one too. I ordered mine a half hour before the unveil, so I estimate my number in line is ~100,000. I expect the vehicle to be delivered ~2019, but I have no problem waiting for however long it takes them. I have to agree with AAP's range arguments, 215 miles (346 km) is plenty for almost every circumstance. Don't forget that there is an expanding network of charging stations (at least here in the U.S. anyway) so if you have to go really far, you can avail yourself of one of them. While I approve realistic consideration of problems, I also consider imaginative solutions. Your approach seems to be based on pessimism rather than objective extrapolation of problems/solutions prospects. For example, your pessimism re range/charging etc is easily dispelled if you consider both @antialias's point re 'base need' versus 'special need' re range, and @TopHat's point re ubiquitous power poles/sockets availability for easy/cheap/free charging on long trips. Range extension options are 'plug-and-go rent-a-battery' as needed; much like rent-a-car/trailer business model//operation involving many interlinked 'franchise' pick-up-and-drop-off branch offices along the way/at destinations. Charging at ubiquitous power poles easily done if authorities use clean-energy/transport savings (in local infrastructure/agriculture/health etc costs from pollution/CO2) for initial cost of installing suitable type of charging sockets at poles. You built the strawman argument. You created some fictional place where there are 8 hour outages and people can't remember to plug in once a week. I am asking again: where is this place? So what? Since your average daily commute is 30 miles, there's plenty of juice left in your car. And no, glitches/brown outs/what-have-you don't happen everywhere. I can't even remember when we had the last one that lasted more than a few seconds. Weird how they get these averages, then, ain't it? Maybe you should actually READ the link and excerpt you posted? And the try to understand what it actually says? Or do you need a little help? One thing to remember that even electric powered vehicles like the Tesla is not without a carbon footprint as 65-percent of all the electricity used in the United States is from fossil fuel which means while the Tesla generates no greenhouse gas, the electricity it consumes on every recharge does; thus, Tesla should do the math and calculate how much greenhouse gas is generated for the electricity needed to recharge a Tesla vehicle to travel 12,000 miles. I have to agree with AAP's range arguments, 215 miles (346 km) is plenty for almost every circumstance. ........he lives in Germany & walks two blocks to the grocery store.......I know this because he told us this in another post a few months ago. He also rides a bicycle. Let's see if he comes back with a different lifestyle narrative just like he has about ten different stories about what he has a college degree in. Tesla S. Rich pseudo-environmental D.B. jack------ trendoids FEEDING off subsidies provided by MIDDLE CLASS tax-payers. Disgusting. Politicians should be lined-up and run over by the Teslas. AAP is right and that's why 99% of vehicles out there in the world are EVs. "motorists 30-49 years old drive an average 13,140 miles annually, more than any other age group." That is an average of only 36 miles per day, meaning a base model Tesla 3 should be driveable for about 6 average days before running out of power. Nobody is denying that 215 miles will not always be enough for everyone, but the stats suggest it is good enough for most situations. To be candid, because I have never owned an electric vehicle before, I plan to take a hard look at buying an upgraded battery and AWD from Tesla for both range and performance purposes, but that is probably more a personal preference than an absolute necessary. Unwarranted sarcasm aside, improving battery technology trends strongly favor this outcome over time. It has been predicted that by 2040 an electric vehicle will be less expensive than a similarly equipped gasoline vehicle to purchase, maintain AND operate. Once EVs are widely available and cheaper in every way, you can bet gasoline powered vehicles will be on their way out. On top of that, as solar continues to improve, people will be able to at least partially power their vehicles from their homes, further offsetting the cost of a solar installation. And there's another elephant in the room: Resale value. What exactly will someone hope to get a buyer to pay in ten years if they buy a gasoline powered car now? Who is going to buy it? No one. AAP, I agree, especially since Tesla and others are making big strides to extending battery life. From a technology and financial point of view (see Tesla's stock price), it is clear electric vehicles are on a trajectory to replace gasoline powered vehicles. We have seen many such disruptive technological transformations over time in computers, television and video playback equipment, and in all likelihood, this will be yet another one. Unless you happen to be one of the reprehensible Koch Brothers or their ilk, we should all be grateful this is happening because it gives us a chance to decouple automobiles from fossil fuels to reduce our overall carbon footprint with wind, solar, nuclear, and hopefully fusion. it is clear electric vehicles are on a trajectory to replace gasoline powered vehicles. Just today Volvo announced that by 2019 every one of their newly built cars will have an electro motor (i.e. be mostly hybrid...but they're also planning five full EVs by 2021). This year they stopped any further development on their diesel motors. Things are changing faster than some people may think. its fifty years overdue .... in ten years no more auto mechanics or gas stations... everything will be plug and play do it yourself swapable fixes... avoid recreating the current nightmare cycle of repairs maintenance and fuel ups that consumes so much of car ownership.... hopefully soon autonomous vehicles will eliminate the need to own a vehicle directly ... pay as you go autonomous electric vehicles is where this is heading in the next 10 years . I wouldn't go that far. There's still plenty wear-and-tear parts in an EV which will need eventual replacement/repairs. Tires, bearings, windows, brakes, electrical components (which will see an increase in service as ever more such components are incorporated), and all the usual small stuff from defective lights/turn indicators, AC components to the occasional dent in the bodywork. If current experiences are any indication trips to the garage should be less frequent overall, though. As for gas stations. It might be worth looking into buying up city gas stations. The real estate is certainly worth a bundle and well need less of those. You built the strawman argument. You created some fictional place where there are 8 hour outages and people can't remember to plug in once a week. No. In case of a full blackout: the cars have to remain off for the safety of the grid and themselves. If the problem persists and they try to draw lots of current through a faulty connection, they may cause further problems. During the week I charge at a parking garage in the city. They installed a 120v/12amp plug for me. All week it worked fine, charging at the full 12. Then yesterday it slowed down to 5amps. And what its showing is 5/5, meaning its only trying to charge at 5 amps. You won't be happy to find out in the morning that the car has decided not to charge itself. The abovementioned problem is caused by the Tesla car experiencing a brownout and interpreting that as a flaky grid connection - for example, a cable that is too thin to safely charge at 12 Amps because it's only been designed for 6 Amps which is the case for many lighting circuits. Another variant is an extension cord with a loose plug - anything may cause the voltage to sag, the car detects that, and determines that it has to charge slower in order to prevent a potential electrical fire. And on the point of charging from just any old socket, Tesla cars actually have significant standby power demands, so much of the charging budget out of a 120 Volt socket goes to just keeping the computers and DC-DC converters on instead of charging the battery. If the car errs on the side of safety, then simple grid glitches that last for seconds will cause trouble for the many.